As a graduate student I heard wonderful stories about Karl Knaths from my teacher Ben Summerford who had studied with Knaths at the studio school of the Phillips Collection in Washington, DC. According to Summerford, Knaths would critique with a box of pastels in hand from which he would pull out various colored sticks and draw on students’ artwork to demonstrate the power of color, mass & line to co-ordinate the different parts of the picture. (How many students today would tolerate such graphic intervention?) He was a passionate artist and a passionate teacher. 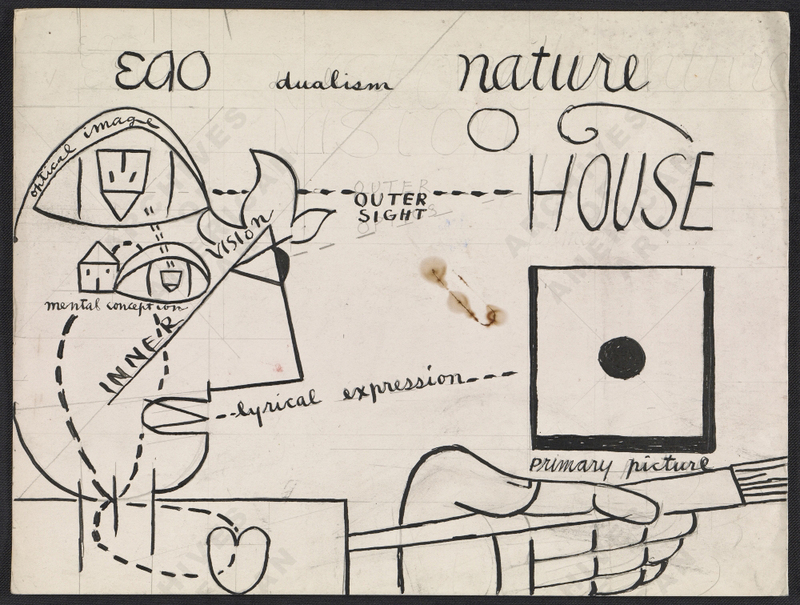 Among his papers Knaths left behind this curious little diagram which is now in the Archives of American Art. In a few lines he encapsulates the artistic process, or what he called “lyrical expression.” Perceptions of nature (outer sight) are worked over by the mind (inner vision), informed by both the optical image and by mental conceptions. The “heart,” or emotions, and the mind become linked in a kind of figure-eight flow prompting the hand to act. Most compelling is the parallel that Knaths draws between the mouth and the hand in the act of “lyrical expression” in which he seems to be telling us that art is a language, not just a set of techniques. Karl Knaths, an early modernist who worked in a cubist idiom, was born Otto G. Knaths in Wisconsin in 1891. In 1912 Knaths enrolled at the Art Institute of Chicago, graduating in 1916. As a guard at the Chicago presentation of the Armory Show (1913), he was first exposed to modernism and began to incorporate into his art aspects of the progressive styles, particularly that of Cézanne. After a brief stay in New York in 1919, he became a lifelong resident of Provincetown, Massachusetts, where he exhibited landscapes and still-life paintings regularly with the Provincetown Art Association. Influenced by the works and writings of Wassily Kandinsky (1866–1944), Knaths became interested in music and believed that there were correspondences between musical intervals and spatial proportions, a theory that suited his cubist pictorial structure. Knaths visited New York frequently, participating in the 1921 Society of Independent Artists exhibition and Katherine Dreier’s 1926 Société Anonyme exhibition in Brooklyn. His first one-person exhibition was held at The Phillips Collection (then the Phillips Memorial Gallery) in 1929, followed by a show at Daniel Gallery, New York, in 1930. As an artist for the Works Progress Administration (WPA) from 1934–1935, he painted murals, and from 1938 to 1950 taught an annual six-week course at The Phillips’s Art School. An outstanding teacher, Knaths instructed students at Bennington College, Vermont, and he lectured at Black Mountain College, North Carolina in 1944 and at the Skowhegan School of Painting and Sculpture in Maine in 1948. In 1951, the Art Institute of Chicago presented him with an Honorary Degree, Doctor of Fine Arts, just one of many awards that he received between 1928 and 1971. The Phillips Collection holds the largest collection of Knaths’ work, which represents his entire oeuvre; it is comprised of thirty-five oils, four watercolors, four woodcuts, three collages, and one lithograph. * The Phillips Collection, Washington, DC.